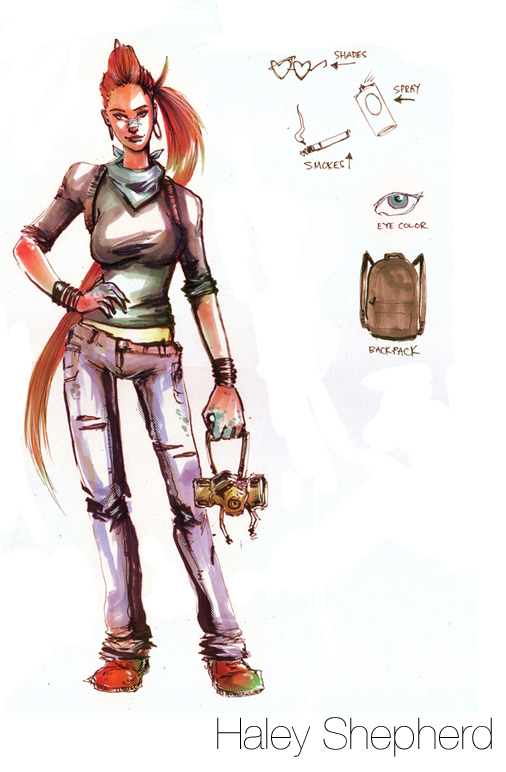 Haley Shepherd is a 24 year old living alone in Void city. She's unsure of where she is going in life. She is friendly, but doesn't really have any close friends anymore. She's independent, and realistic. She can be mean when she's annoyed, but deep down she's nice. She's pretty easy going and tries not to let little things bother her. She smokes, and currently has a broken nose. She currently works at a local coffee shop called Voidbucks. She hates working there. Her apartment is a small studio that she thinks is very over-priced. She doesn't own a lot of things, just the bare essentials. She doesn't have a computer, and sometimes goes to the library or an internet cafe to go online. She spends a lot of time out of her apartment. She likes to just walk around and explore the city. Her hobby is graffiti. She doesn't have a name that she goes by, and she doesn't like to go to any spots in particular. She likes painting portraits of famous voiders, like Pothole the giant shark. She just wants to brighten up the city a little bit, and the thrill of committing a small crime is the only real excitement she has in her life. However, recently the city has been all talking about another graffiti artist name Sinclair. Sinclair has been all over the news because he is wanted by the police for his graffiti. Unlike Haley, he sprays politically charged messages in very public areas. This inspires people to protest and riot in the name of the injustices he writes about. Void is a pretty corrupt city, afterall. Since no one knows the identity of Sinclair, and no one is certain that he is indeed male, Haley has been attacked several times while being mistaken for Sinclair. There is a bounty on his head, issued by some of the people and corporations that he has angered with his graffiti. Her outfits are casual; any combination of jeans, hoodies, or t-shirts will do. She can dress a little funky or weird sometimes. She likes bright colors most of the time. Feel free to make your own outfit for her. Her hair is naturally blonde but has been dying it an unnatural red color recently. Her eyes are blue in the center, and brown around the outside in a bullseye pattern. She frequently has her hands stained different colors from the spray paint.